1. Place the yeast, milk and 2 teaspoons of the maple syrup in a small bowl and mix to combine. Set aside in a warm place for 5 minutes or until the surface is foamy. Place the flour, table salt, egg, butter, the remaining 2 tablespoons of maple syrup and the yeast mixture in the bowl of an electric mixer with a dough hook attached. Beat on a low speed for 5 minutes or until the dough is smooth and elastic. Place in a lightly greased bowl, cover with a clean damp tea towel and set aside in a warm place for 1 hour or until doubled in size. 2. To make the maple glaze, place the maple syrup, sugar and butter in a small saucepan over low heat and stir until melted and smooth. Pour half the glaze into a 20cm x 30cm slice tin. Reserve and set aside the remaining glaze. 3. To make the burnt butter filling, place the butter in a small non-stick frying pan over high heat and stir until melted. Bring to a simmer and cook for 2-3 minutes or until golden brown with a nutty fragrance. Transfer to a medium bowl, add the sugar and allspice and mix to combine. 4. Roll out the dough on a lightly floured surface to make a 25cm x 60cm rectangle. Spread with the filling, leaving a 1cm border. Starting from 1 long edge, roll up the dough tightly to enclose. Trim the edges. Slice into 12 even pieces. Arrange the buns in the tin on top of the glaze. Cover with a damp tea towel. Set side for 1 hour or until doubled in size. 5. Preheat oven to 180C (350F). 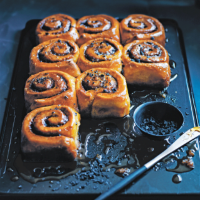 Bake the sticky buns for 25-30 minutes or until golden brown and cooked through. Gently warm the remaining glaze over low heat. Pour over the buns and sprinkle with the salt to serve.